The rain has passed and heat is back on. Now, the question that lingers on everyone’s mind is, “Where can I cool off and not have to swim in a sea of humanity?” It’s when the question gets stuck in the minds of those 12 and under that you’ve got a code red. If you want to avoid the relentless, “Can you take us to Mount Splashmore?” start taking notes. Don’t let the drought get you down – Hamilton Pool certainly doesn’t. This creek-fed pool remains full no matter the lack of rain thanks to the never-ending waterfall that hangs above the pool. Make a day of it and take the scenic hour drive northwest through Drippings Springs by way of Farm to Market 150. Hamilton Pool is under a strict 75-person limit so if you arrive early enough and claim your spot, you know you don’t have to compete for space to dunk, play, swim and canon ball. Word to the wise: call ahead and ensure the park is open before hitting the road. Got a pen? The number is (512) 264-2740. If you’ve been through Wimberley, you know it’s a special place. The town that works to keep big box chains outside city limits is the same town that works to keep their swimming spots pristine and enjoyable for all. 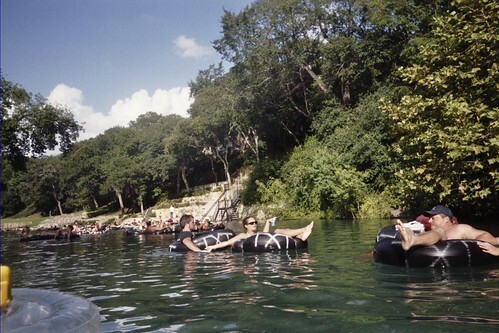 Texas Monthly named Wimberley’s Blue Hole the second-best swimming spot in Texas in August 2008. In 2012, Travel & Leisure named it one of the top 12 swimming spots in the entire nation. Are we beginning to paint a picture? Even for an admission price of $7 for adults, Wimberley’s Blue Hole is worth every penny. Pack for an afternoon picnic on the spacious grass, stock up on the sunscreen and head the half hour east. If you want to stick closer to home, you’re in luck. 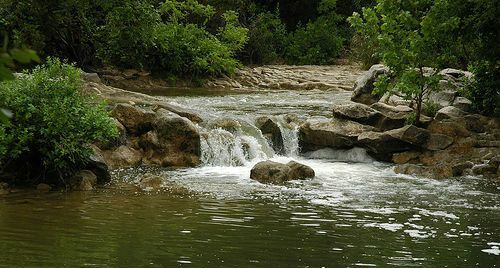 Just 15 minutes down the road, the San Marcos River offers a full day of water recreation, however you like it. Weekdays are best for this trip; since the river is free and open to the public, expect a bit more of a crowd. However, it doesn’t mean the experience is diminished. Enjoy tubing, swimming, picnicking and all forms of summer fun at most any access point. 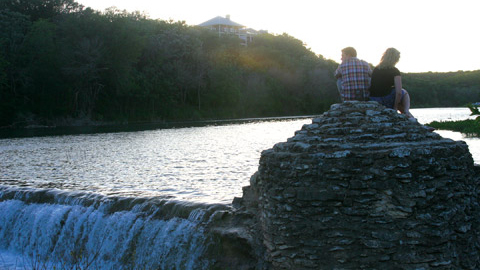 The San Marcos River is the perfect spot to get a quick dip and be home by dinner. For the best way to beat the heat that doesn’t involve succumbing to another day indoors, grab your swimsuit and head to one of our nearby swimming spots. Let us know where you are; tweet us a picture of your good times in the sun! The Barton Creek Greenbelt is an approximately 8 mile stretch of land reaching from Zilker Park to the City of Westlake. 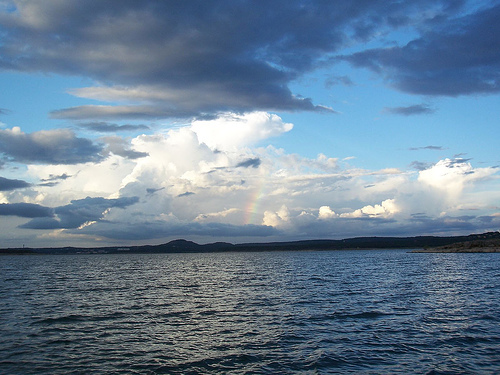 It is divided up into three sections: Lower Greenbelt, Upper Greenbelt, and Barton Creek Wilderness Park, and is characterized by large limestone cliffs, dense foliage, and shallow bodies of water. The Greenbelt offers rock climbing and trails for walking, jogging, hiking, or mountain biking. After periods of significant rainfall, the river fills up and offers swimming, cliff diving, kayaking and tubing. Cavers can also enjoy Travis County’s longest cave, Airman’s Cave, which measures 2 miles long. Situated on the Blanco River in Hays County, Five Mile Dam Park has just been reopened since being renovated and expanded. The new facilities offer access to the river via canoe launches, parking, new sidewalks, and 4 regulation-sized soccer fields. Parks are open from 9am-9pm seven days a week. As renovations continue a large concession and restroom building, hike-and-bike trails, landscaping, 6 additional soccer fields and landscaping will be put in. Ok, so maybe New Braunfels is more of a Go30. But go. You’ll thank us later. Plus, you’ll save a good 20 minutes off people coming from downtown, and that’s if they don’t get stuck in traffic. 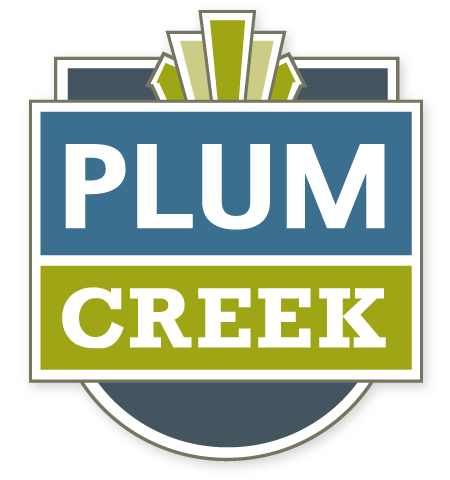 When the summers get Texas hot, head south from Plum Creek to relax on the Guadalupe River. And at a mere 9 miles drive, you can be in the water faster than it takes to order pizza. 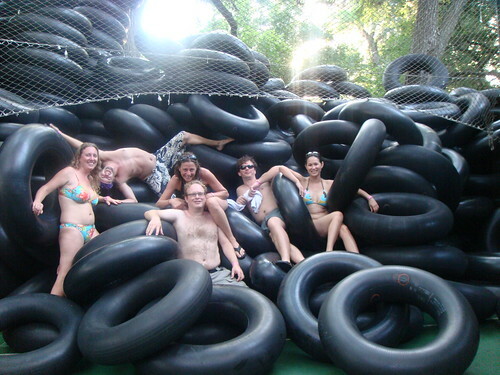 It’s a closer, less touristy, New Braunfels tubing experience. You sit a tube differently than you usually do outside, so make sure to get some sunscreen on the insides of your legs, they tend to burn much faster than usual. If you plan to eat or drink on the river, check the local rules before going. In general the Guadalupe is less strict than the Comal, but it pays to plan ahead. See if your rental company will bus you back to the start. If you have more than one car, it helps to leave one at the end to bus people back.